Team Better Block are urban planning experts who unlock the interest and creativity of the public with a process that designs for community, connection, and commerce from the ground up. At the end of October, Team Better Block brought its forward-thinking approach to street planning to Birmingham and transformed 2nd Avenue between 28th and 29th Streets into a vision of walkability and community. 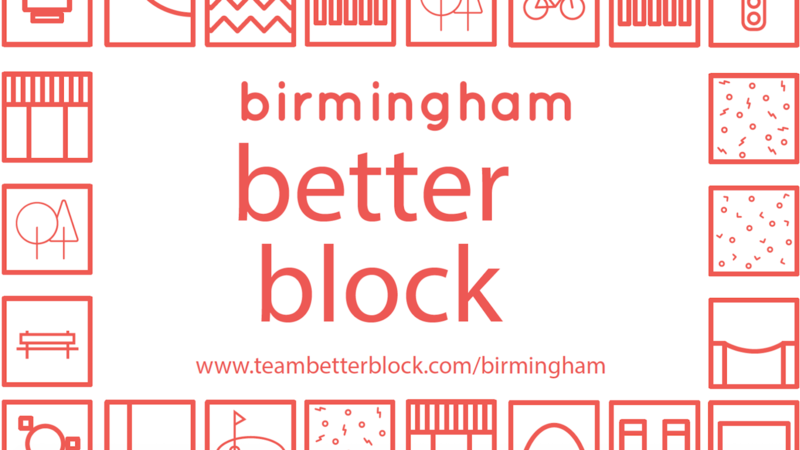 From Wednesday the 24th until Friday the 26th, Team Better Block and its group of volunteers built bike lanes, planters, pop up shops, painting street art, and more. Although the project is taking place at Pepper Place, this is an example of the type of transformation that could happen on any block. Buffers – We’ll be building a long buffer that will protect the shared bike/pedestrian lanes being built. This workshop will include building a buffer structure and planting vegetation. Painting/Striping – We’ll be painting and striping the streets. This workshop will include creating colorful designs on the streets and parking lots surrounding Pepper Place. Volunteers will paint bike lanes, street art, and other interventions to make the area more vibrant. Digital Fabrication – We’ll be building pop up programming spaces for vendors and curb extensions. Wayfinding/Signage – We’ll be creating signage to help ensure visitors can find their way around the reimagined block. For more information about this transformation, visit Team Better Block Birmingham.